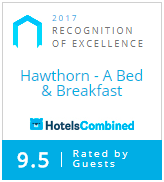 Escape the hectic pace of a hurried world for a time in the comfortable accommodations of the Evans Room at Hawthorn B&B. Named after previous Hawthorn owner, L. Fred Evans, this guestroom is richly decorated in dark olive green and purple, gold, and cream accents. Our most masculine accommodations, this room also features a plaid duvet, chair, and window coverings, instead of floral. Personal touches in the Evans Room include Wendy’s father’s high school graduation picture, our grandfathers’ and fathers’ shaving mug, brushes and razor, and father’s engraved whiskey flask. For your convenience, there are two hall trees for hanging clothes and a roll-top desk. The private bathroom has a standing shower with glass door.